If you've read this book, you may be wondering why I'm reviewing it on Weighty Matters. After all, it certainly doesn't superficially seem to have anything to do with nutrition or weight management. But yet, I think it does. 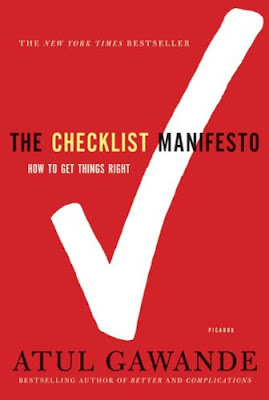 The book itself can be very simply described as a collection of stories that illustrate the value of checklists in ensuring a greater likelihood of success. The author, a surgeon named Atul Gawande by means of a truly marvelous gift for storytelling, takes us through the use of checklists on construction sites, in airplanes and most importantly to him, in the operating room. It's a compelling and easy read, and the clear cut case he makes for checklists made me pause to think about how they might be employed for weight management. We know that for some reason, keeping track of intake is one of the foremost predictors of success. Could checklists be utilized to help make record keeping easier and bolster other health promoting behaviours? Would going through a simple checklist a few times a day impact on success? Interestingly there's often a great reluctance on the part of those unfamiliar with them, to embrace the use of checklists. Gawande posits that perhaps our own senses of infallibility are offended by the notion of something so simple as a checklist being useful; that we think ourselves to be above them. "The checklist gets the dumb stuff out of the way, the routines your brain shouldn't have to occupy itself with"
I wonder if therein lies the issue with food diarizing. With studies demonstrating that people lose twice as much weight when utilizing a food record, and with food record keeping taking all of 5 minutes a day once you're good at it, why then is it such a challenging behaviour for people to adopt? Perhaps a checklist that forces us to look at what many might feel is, "the dumb stuff", would help in fact get it out of the way. I'm going to explore this a bit with my patients, and whether you choose to or not, there's one thing this book makes abundantly clear. If you're having a surgery, for the love of all that's holy, ask your surgeon if he or she uses a checklist, and if he or she doesn't, buy them a copy of this book before your operation. It might be the best $15 you'll ever spend.